Mashups have been done of practically everything you can think of. Some of them are awesome, some not so awesome. Here’s a mashup that will make you really happy if you like Star Wars (and are starting to hate Lucas, maybe), and you believe that you were a pirate in your previous life. The tee shirt is called YArr2-D2, definitely not the most imaginative name, but still catchy. 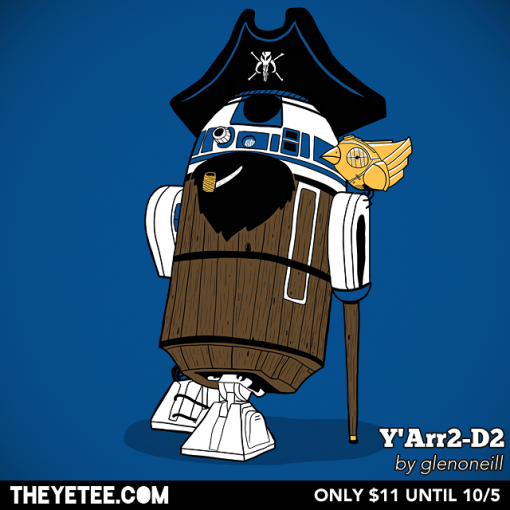 The YArr2-D2 tee shirt is designed by Glen O’Neill, who describes himself as a being “just a big geeky artist”. He is based in Victoria, Canada. His day job is Production Coordinator at a place called The Martlet, but what is really cool is that he designs tees and draws comics in his spare time. From the looks of this latest tee that he designed, we should all be thankful for his employer as it seems he gets the spare time to come up with awesome things that ordinary mortals like you and me can enjoy. The tee shirt is available in royal blue ((Don’t complain about the lack of color choices; just be thankful it’s not in pink or purple!)) and comes in various sizes for both men and women. Here’s the cool thing – the tee shirt only costs $11! NOTE: If you need a 2XL or 3XL for men, you will have to add $2. The YArr2-D2 shirt is only available till the 5th of this month, so I suggest getting one now if you even remotely like it. You’ll definitely regret it when you decide later you want one, only to find out the YArr2-D2 shirt is not available anymore! The shirt is brought to us by The Yetee, a tee shirt company that features new designs every 96 hours. Their shirts are always priced at $11. This is very reasonable considering the quality of the designs, and if you compare the price to other tee shirt stores online, you’ll definitely get hooked and check The Yetee every time they put up a new design. Oh, and they also give away free tee shirts – pity the giveaway for the YArr2-D2 shirt has expired!